Rainy weather didn't dampen the enthusiasm shown by young Brazilian entrepreneurs at "Start-up Brasil Demo Day," reports Chris Knight. It was a packed house earlier this week, for San Francisco's first showcase of top startup talent being accelerated in by Start-Up Brasil and its government partners. The passion and elation in the air reminded me of Silicon Valley startups in the 1990s. And judging by more than 100 VCs, bankers and corporate fund managers from the likes of Accel Partners, American Express, GE, Intel, Redpoint, Samsung and Silicon Valley Bank - many industry watchers had interest in hearing more from eleven of Brazil's top startup founders. Before the first round of startup presentations Felipe Matos, a serial entrepreneur starting at the age of 16 and founder of Start-Up Brasil, gave an update on how the new startup acceleration program had paid off since its launch in 2013. The report card was impressive. Private funding outpaced public funding by near 2X, and average monthly revenue growth had more than doubled between February and August. Final growth rates for the collective startups is projected to come in at more than 135 percent, which places class one in fifth place of the 250 fastest-growing SME's in Brazil, the world's seventh-largest economy. What's the secret sauce for such impressive growth? Startup founders in the program said they needed to generate revenue as quickly as possible. "There's less funding and less investor patience in Brazil compared to Silicon Valley - and we know we're under the gun to perform well from the start," said one founder. Most of the class-one startup leaders at the event praised the attention, support and counsel they received from the program's 15 accelerators -- including 21 212, Acelera Partners, TECHmall and Wayra. Matos described it as an "alliance for startups," which is supported by government, private and public entities including Apex-Brasil, CNPq, Brazil's Ministry of Science, Technology and Innovation (MCTI) and Softex. So far, here have been about 3,000 applications and nearly 200 startups funded. The Start-Up Brasil program provides up to $80 million in grants, access to top Brazilian accelerators and international hubs in New York, San Francisco and Singapore. The biggest opportunities in Brazil center on the Internet, e-commerce and mobile sectors. For example, online insurance is behind that in the US. Other hot sectors include education, healthcare and infrastructure. "There are 100 million Brazilians online, and another 100 million people still to go online," said Anderson Thees, co-founder at Redpoint e.ventures. 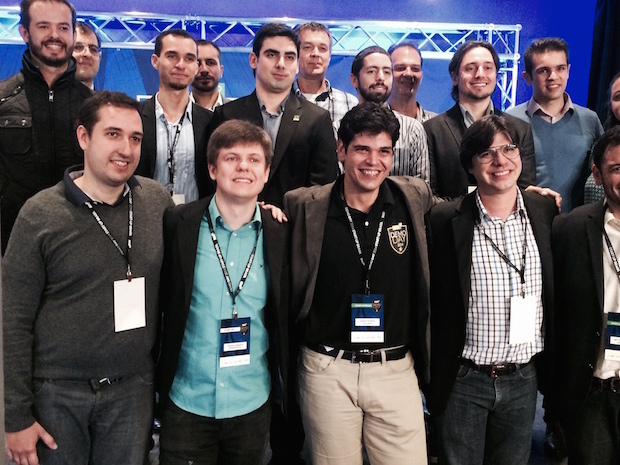 "There are critical gaps to fill in Brazil that create opportunities for investors and startups." As Virgilio Almeida, MCTI secretary, noted during the event's kickoff: "We launched this acceleration program last year to identify and promote some of the most promising entrepreneurial talent in Brazil and beyond. We're proud of their success and progress so far, and look forward to watching them bloom." Bovcontrol - Danilo Leao, founder and CEO of Bovcontrol, provides cattle ranchers with vital online data about the more than 200 million head of cattle on Brazil's plains, and more than 40 billion animals worldwide. Bovcontrol has been referred as the "Google analytics of cattle." Retailers McDonald's and Wal-Mart are interested in Bovcontrol so they can be better understand the origins of food from suppliers. Evobooks - Its platform that brings digital content to life through interactive 3D books and is being used in more than 1,100 schools in Brazil. Most of its content is focused on S.T.E.M. Education. Students using Evobooks increased their performance by nearly 30 percent over a control group, and nearly 75 percent of teachers use the BooksApp to prepare their lessons. Sensorbox - in Brazil and other emerging markets, electricity blackouts happen frequently. Sensorbox is helping curb business losses such as food and medicines going bad through hardware and software tools that monitor power lines to report problems and help solve them before they become too serious. The technology also works with solar power and it can be used to monitor meteorological stations for earthquakes and tsunamis. Chris Knight has worked as a brand-marketing consultant for startups and global corporations in Silicon Valley for nearly 20 years.